Home theater control to evolve into complete smart house system. Apr. 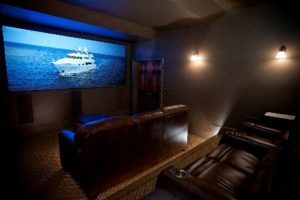 11, 2014 — by LISA MONTGOMERYHaving played six seasons in the NFL with the Cincinnati Bengals, offensive lineman Dennis Roland knows what it takes to keep a good play in motion—a solid game plan and teamwork are two that he recently applied when building a home theater in his new approximately 6,500-square-foot home in Bishop, Ga. Rather than tackle the job himself, he hired the custom electronics (CE) professionals at Digital Logic Systems, Peachtree City, Ga., to design and install his dream theater—and the project soon evolved to include the distribution of music and video throughout the house an into the back yard. While they were at it, Digital Logic Systems devised a way for Roland to check up on the house remotely while he’s traveling and gave the Rolands plenty of other options to ponder for future integration. Rather than complicate matters by installing separate systems to handle each task, Digital Logic Systems placed the operation of the home theater, the distribution of entertainment and the monitoring of the home under the rule of an ELAN G! home control system. The home theater would remain the focus of the project, though, says DIGITAL LOGIC SYSTEM’S Daniel Solly. “With Dennis on the road so much training, he just really wanted to get the theater up and running first, then scale up the system to handle other tasks later as he has more free time to dedicate to the project.” This gradual expansion of functionality was the main reason Digital Logic recommended the Elan g! system—this, and the fact that Roland and his family would be able to operate the theater and other elements from a mobile Elan app on their existing iPad mini and iPhone devices. As the building off point for a complete smart home, the theater is a showpiece of sophistication. A 133-inch Black Diamond Zero Edge screen from Screen Innovations paired with a JVC DLS-RS46U establishes a high standard of video performance for the room. Featuring special technology, the projector is able to shift the zoom and focus of its lens automatically to suit the native format of the particular content being displayed. For example, it can shift from projecting a 16:9 (widescreen) formatted movie to a 2.35:1 (CinemaScope) formatted movie without the addition of a special (and expensive) anamorphic lens. Digital Logic Systems complemented the video setup with a 7.1 surround-sound arrangement of Episode speakers which were recessed into the walls and ceiling. Rather than sequester all the good content (DirecTV, AppleTV, Blu-ray Disc, Fusion Research Ovation Music Streamer) to one room, Roland took advantage of the in-ceiling speakers that had been installed by the previous homeowners by having Digital Logic install switchers and processors to distribute audio to rooms throughout the house. Niles outdoor speakers were added to the back yard to extend the music to the pool and barbeque areas. Video travels, as well, to a new 55-inch Sharp TV in a lounge area and a 65-inch Sharp TV in the living room. The Elan g! system lets the owners manage the delivery of audio and video via their iDevices or an Elan HR2 handheld remote. With plenty of Elan g! experience under its belt, the Roland family feels comfortable moving on to phase two, where lights, thermostats and motorized draperies will be linked to the automation system. 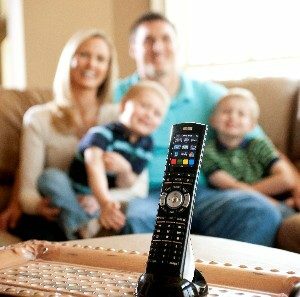 They’ve already mastered the iPad- and iPhone-based controls and understand the impact that technology can have on everyday life, so these additions will feel as effortless and natural as taking the field on NFL sundays.